What is ground effect (GE) and how does change the way your RC heli reacts while hovering close to the ground? First off GE is not just limited to helicopters; anything that is flying close the ground will experience it. GE for any aircraft is caused by the increase in air pressure as the aircraft is flying close to the ground. This increased air pressure is caused by the air being pushed downwards by wings or rotors. Since the aircraft is close to the ground, the downward rush of air has no place to go, so air pressure builds under the aircraft. Please note however, this is not really what is happening, it's the decrease in drag that increases lift efficiency. It's just easier to explain and visualize using the "incorrect" cushion of air method. Helicopters will of course experience GE when they are hovering close to the ground. That is why we refer to it as the Ground Effect Hover. So how close to the ground do you have to be? It depends on the model, but half the rotor diameter or one rotor blade length is generally where the effect begins and it gets exponentially stronger as you get closer to the ground. This is pretty universal for all helicopters, not just RC. I was talking to a Bell 206 helicopter pilot about GE a number of weeks back, and he said the exact same thing. Of course, real helicopters depend on GE much more then our smaller RC birds due to the fact that most of our birds are way overpowered compared to most real helicopters. On a hot day with a fully loaded to maximum capacity Bell 206, you can bet the only thing that enables it to lift off the ground is ground effect until the pilot can start moving forward fast enough to generate translational lift . When your RC helicopter enters GE, you will notice one thing for sure right away. You won't need as much power to hover. This is universal no matter how simple or sophisticated your heli is. You will experience it on the smallest of micro coaxials or the largest of single rotor collective pitch gassers or turbines. Note, this experiment has to be done in near zero winds to get the best, most noticeable results. 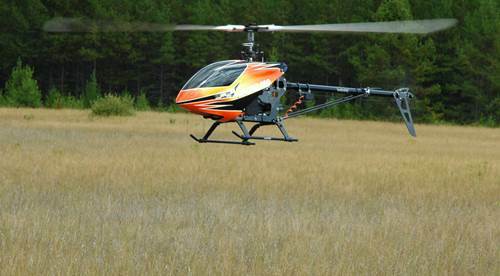 To test GE on your real bird, get your RC heli into a nice stable 3 to 4 foot hover. Now decrease the throttle/collective ever so slightly so the heli starts to descend slowly. As you near the ground, you will find the heli will start encountering the bubble of high pressure (at about 1/2 the main rotor diameter) and stop descending, you are now in ground effect. The nice thing about ground effect is it allows you to concentrate almost 100% on your cyclic controls since the lift generated by the main rotors is somewhat self-correcting while in GE. What you will notice is if the heli starts to descend while in GE, the pressure builds even more (okay the lift efficiency builds more) and stops the decent. On the other hand, if you are gaining a little altitude while in GE, once you get too high (over half a rotor diameter above the ground), the extra lift efficiency is lost and your heli will settle back down until it is in GE again. It is really neat to experience this "self-correcting lift equilibrium" and is a fun little experiment to try no matter what kind of bird you have. This is a great way to really hone your cyclic control skills and if you have a good heading hold gyro, you will be able to fly your heli for a long time without even touching your throttle/collective and tail rotor stick. This is the only time you can fly a single rotor collective pitch RC helicopter (for any length of time) with one hand - on your cyclic stick of course. There are several circumstances that can reduce how much GE your bird encounters. First off, if the wind is blowing as I just touched on for that experiment to work correctly, the effect won’t be as noticeable. The wind is basically blowing that high pressure air bubble under your helicopter out of the way and creating translational lift at the same time. Second, if you are hovering over thick grass or brush, the high pressure bubble won’t build up as strong as if you are hovering over pavement or water. Now depending on the size of your RC helicopter, you may also notice the cyclic controls become more sensitive while in GE. Makes sense if the lift efficiency has increased, the sensitivity of cyclic response will also increase. The down wash of air off the rotor blades (called rotor wash) is also causing many air flow instabilities that add to the ground effect sensitivity. For example, I don’t notice any change in helicopter sensitivity when my larger birds are hovering close to the ground even though the lift efficiency increase is very apparent. On the other hand when my 450 or smaller helicopters are a few inches off the ground, the cyclic controls do become more sensitive and require more skill to keep them hovering perfectly still. Micro sizes can actually be very difficult to hold perfectly still in hover while in GE because the rotor wash throws them all over the place. Based solely on my experiences (with RC helicopters of all sizes), I think most of the control issues when in ground effect are mainly caused by the turbulant rotor wash air and not by the cyclic becoming more sensitive due to the efficiency increase. Remember, you learn to fly RC helicopters from the ground up. This is not easy if your bird is being pushed all over the place by rotor wash. This is yet one other reason some people find larger RC helicopters easier to first learn on. Ground Effect is something you shouldn't concern yourself too much about. However I thought it important to touch on so you know why your RC helicopter has an increase in rotor efficiency when hovering close to the ground and perhaps seems a little more sensitive and difficult to keep perfectly still. It's also really fun to hover in that "self correcting" zone and experience ground effect first hand.